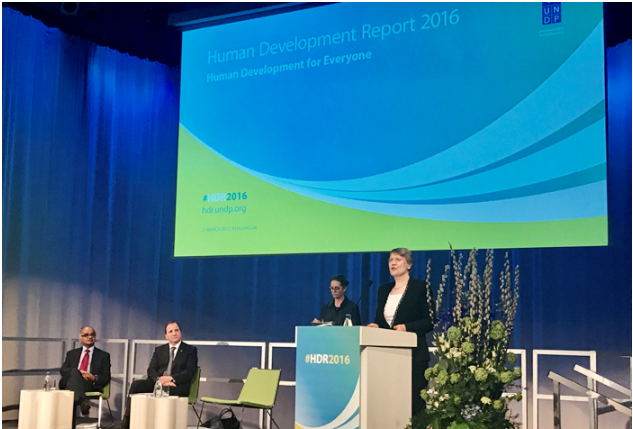 I am delighted to join Prime Minister Stefan Löfven at this launch of the 2016 Human Development Report here in Stockholm. Sweden has long championed human development, and the results of its commitment and investments are reflected in its very high ranking on the Human Development Index. Further, Sweden has long been a generous contributor to lifting human development through its support for international development co-operation. This report, “Human Development for Everyone”, has a particular focus on those who have been left behind by development progress over the past 25 years, and how that exclusion can be overcome. Ensuring that development progress is broadly shared is not just the right thing to do; it is essential to building and sustaining the foundations for the peaceful, just, and inclusive societies envisaged in the 2030 Agenda. That Agenda too puts people at the centre of development as its ultimate beneficiaries, and seeks to advance all three strands of sustainable development – the economic, the social, and the environmental – simultaneously. Allow me to highlight three of the report’s key messages. Averages disguise inequalities. The Human Development Index (HDI) has registered substantial progress on average in every region since 1990 – across educational attainment, health status, and income levels. Yet when one looks beneath the averages, it is clear that a significant number of lives have been scarcely touched by that progress. One-third of the world’s population continues to live in low human development, and hundreds of millions of those people live in countries classed as having medium, high, or very high human development overall. In almost every country, certain groups are more disadvantaged than others. These include women and girls, rural populations, persons with disabilities, ethnic minorities, indigenous peoples, migrants and refugees, older people, and LGBTI communities. The disadvantage they face is multidimensional. Those born into disadvantaged families are more likely to suffer disadvantage themselves throughout the life cycle. Those who have been systematically excluded often face deep and persistent barriers which are embedded in laws and local norms, resulting in unequal access to economic resources and political participation. They are also more vulnerable to the impacts of shocks and crises. Gender inequality and the lack of women’s empowerment remain significant challenges to global progress on human development across all regions. Women tend to be poorer, earn less, and have fewer opportunities to participate in civic life than do men. In some countries, a husband’s permission is still required for a wife to work. In around 100 countries, women are denied access to certain jobs – including factory jobs or working at night – simply because they are women. Ensuring human development for everyone requires better data and analysis to inform policy and action. National statistical systems need to collect disaggregated data across a wider range of socio-economic indicators. Even gender-disaggregated data is in short supply in many countries. New sources of data, like “big data”, need to be tapped to expand knowledge of where development challenges lie. Both quantitative and qualitative data is needed to inform policy. It is encouraging, for example, to know that girls’ enrolment in primary education has increased in many countries, but discouraging to learn that in half of 53 developing countries with relevant data, the majority of adult women who completed four to six years of primary school are illiterate. The report recommends taking a broader view of development which recognizes both the traditional more tangible, aspects of development, such as better health and education, and the importance of more intangible aspects. Voice and empowerment, for example, are both objectives of human development and a powerful means by which communities can achieve it, including by ensuring that all groups are represented at the table when national priorities are being set. Global institutional reforms which produce a fairer multilateral system are important for development to reach everyone. The report argues that these reforms should support better regulation of global markets, governance of multilateral institutions, and strengthening global civil society, and that they should address key challenges like the generation of global public goods. Ensuring that policies and programs which promote human development are designed for and reach everyone, including those who have been left behind. Making development more inclusive is a critical component of this. The Global Deal which Prime Minister Löfven champions is cited in the report as a good example of promoting inclusive development. The Global Deal would put decent work at the centre of macroeconomic policy. It needs support from national governments, employers, unions, and broader civil society. Recognizing that the most disadvantaged need extra assistance to overcome discrimination. This is important if human development for everyone is to be realised. Making human development progress more resilient. A range of shocks – from natural disasters and epidemics to economic crises and conflicts – can reverse hard won development gains, and they generally hit vulnerable and marginalized groups the hardest. By building resilience into development pathways, including through stronger social protection systems and effective risk management, countries can mitigate against shocks and development setbacks. Allow me to conclude by emphasizing the optimism of this report. Human development for everyone is not a dream, it is attainable. Sweden has long inspired me with its commitment to equitable development. Now the 2030 Agenda provides commitment at the global level to leave no one behind in development. The Report we are launching today shows how the human development approach supports achieving the broader 2030 Agenda and building a more peaceful and equitable world.